In an era in which people are on social media constantly sharing pictures and what they're thinking at any given moment. We are encouraged to reveal, share, and promote ourselves, and that pressure does not just come just from our peers, but from vast and pervasive technology companies that want to profit from patterns in our behavior. The notion of disappearing has never carried so much allure. Akiko Busch, an essayist who is on the faculty of the School of Visual Arts in New York City, seeks to explain her own uneasiness with this arrangement in her new book How To Disappear. She senses there is a widespread desire for a less scrutinized way of life, essentially for invisibility. A lifelong student and observer of the natural world, Busch writes in rich, deep detail about her own life, her family, and some of the most remote places in the world, from the Cayman Islands to Iceland, and the joy of being unseen. 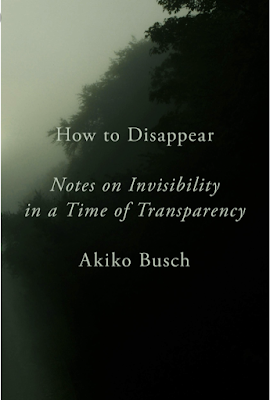 Busch discovers and dramatizes a wonderful range of ways to disappear. From virtual reality goggles that trick the wearer into believing they have disappeared, to the way Virginia Woolf's Mrs. Dalloway finds a sense of affiliation with the world around her as she ages, Busch deliberates on subjects that are new and old with equal sensitivity and inclusiveness. "In the woods no more than an hour, I am struck anew by invisibility, and its improvisational choreography, as a necessary condition of life," Busch writes of a trip into the wilderness. "I am reminded of the grace of reticence, the power of discretion, and the possibility of being utterly private and autonomous yet deeply aware of and receptive to the world. If I am enchanted by staying out of sight, it is because such behavior seems so rare in our own species. In recent years, we have been more preoccupied than ever by the question of how to stay in view. "Yet we humans have our own diverse ways of being seen or unseen. We have our own metrics of invisibility, and our vision is a matter that goes beyond the electromagnetic spectrum. We make ourselves known or not, and familiarity, color blindness, and peripheral vision are the least of it. We have devised a vast catalog of inventive strategies - physical, psychological, technological - for how we maneuver our way in and out of one another's sight lines. They can be captivating, enchanting, deceptive, manipulative, hopeful, despairing, gracious, isolating, logical, illogical, strange, and altogether mysterious. This age of increasing transparency is time to consider them anew. "Visibility has become the common currency of our time, and the twin circumstances of social media and the surveillance economy have redefined the way we live. In his landmark 1979 book, The Culture of Narcissism, Christopher Lasch noted that 'success in our story has to be ratified by publicity.' Forty years later, our cult of transparency shows his presience, as do the enabling new technologies. It has become routine to assume that the rewards of life are public and that our lives can be measured by how we are seen rather than what we do. "The exposure begins at home, a place once considered private. In the nursery, internet-connected baby monitors equipped with high-resolution lenses, built-in microphones, and motion sensors may serve security, but they also reconfigure the relationships between parent, infant, and caregiver. The Internet of Toys - Barbies outfitted with Wi-Fi, Bluetooth-equipped kitties, teddy bears that allow for voice messaging - promotes interactivity but can be easily hacked for the child's own data, including address, birth date, photos. A smart refrigerator in the kitchen can gather shopping habits, information we may willingly surrender, but numerous brands of smart TVs track viewer data that advertisers can access for targeted marketing. Robotic vacuum cleaners have the ability to map our rooms, and Alexa, Amazon's personal home assistant, can produce evidence in court of what we say and do. Send an email, use Google, research something, anything, online - a dress, a book, a roasting pan, a lawnmower - and these items digitally trail us in endless pop-ups and sidebars. "Leave the house, and our cell phones deliver location data to servie providers. Pass through a tollbooth, use a credit card, rent a car, or take a plane, and Big Data can gather even more personal information. But even if we don't do any of these things, dash cams, body cams, and backyard cams, along with closed-circuit security cameras at banks, malls, gas stations, transportation hubs, convenience stores, and street corners, observe our activities with little regulation." How To Disappear is a field guide to invisibility and reacquaints us with the merits of being inconspicuous, and finds genuine alternatives to a life of perpetual exposure. Accessing timeless truths in order to speak to our most urgent contemporary problems, she inspires us to develop a deeper appreciation for personal privacy in what is increasingly an intrusive world.